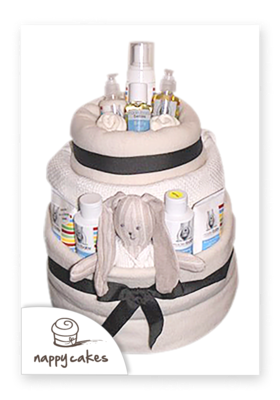 Nappycakes are unique gifts created for the parent(s) of a newborn. 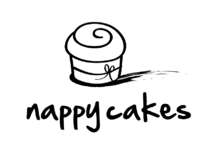 create a nifty cake gift! 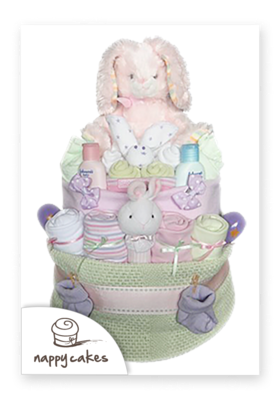 Created with a colour schemed assortment of items, such as a hat, onesies, singlets, scratchie mitts, socks, a blankie, nappies and lots of other handy little items. We've put time and effort and a lot of love into creating these wonderful gifts, you or your recipient will definitely appreciate the gift! 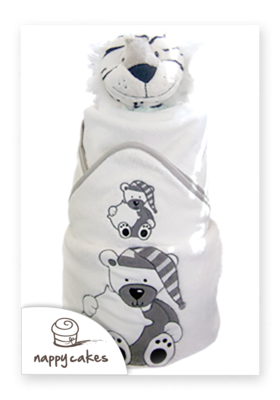 You won't want to unravel one of these custom designed creations! 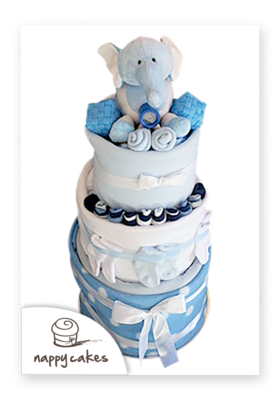 We custom make every nappycake for our customers, with a selected colour palette in mind or by request. If you'd like to order one, just email us with a delivery date and a colour theme - we will do our best to work with it. If all you know, is that you need a girl / boy / neutral themed nappycake, you can leave the rest up to us! 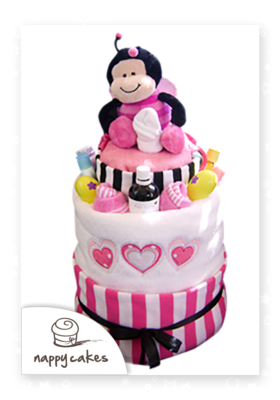 Every single nappycake is unique, and are never make the exact one twice. 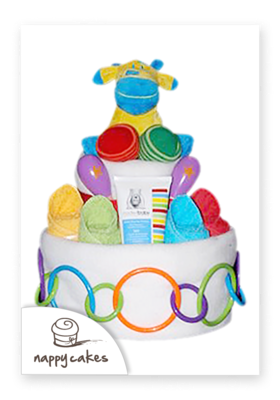 Ingredients for each nappycake vary depending on the stock and colours available at the time. Browse our selections below - a few are pre-made for sale, but others are examples, as we custom make every one to order! 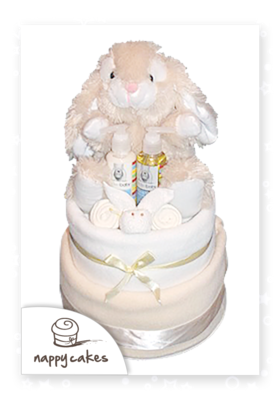 Ingredients for each nappycake vary depending on the stock and colours available at the time. 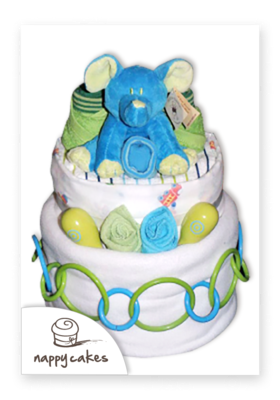 Typical nappycakes can consist of any of the following: an assortment of nappies, blanket or throw(s), tee shirts, onesies, socks, booties, bibs, teething toys, soft toys, mini shampoo/ bath wash/ talc powder, lotions, and ribbons. Themed, character, animal, or simply a colour co-ordinated cake, there are so many options we can do for you. Once finished, the nappycake is completely wrapped in cellophane and ribbon to be presented to the recipient. Order your own masterpiece gift! We are happy to help you, and Jenni is only an email away. 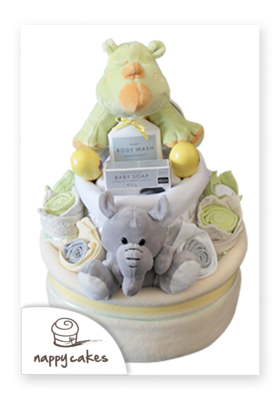 Based in Auckland, NZ, Jenni will stay in touch with you, create a nappycake for you or your receiver. 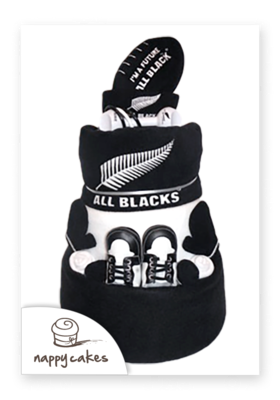 We can arrange to deliver it for you too - these are delicate items and we don't usually like to put them on a courier because they might get ruined in transit, so unless you don't mind things moving around ... Auckland delivery enquiries only please.